Do not dismiss your dream. Pin Pitch: 2mm. There are slight difference between the picture and the real item caused by light brightness,hope you can understand. Do not run through your life so fast that you forget not only where you have been, but also where you are. 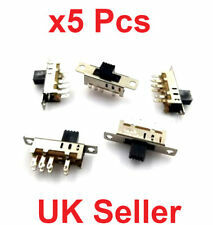 56 Series, Twin Sliding Switch, Change Over, 1 Pole, 10A, 250V, Less Enclosure, grey. o Contents: 1 SLIDING SWITCH. o Colour: Grey. o Colour cover: Grey. o Type of switch: On/Off switch. o Number of switch positions: 2. Industrial Surface Mount Sliding Switch - IP56. 250V 10A Twin Sliding Switches Auto/Man On/Off. o Contents: 1 SLIDING SWITCH. o Colour: Grey. o Type of switch: On/Off switch. o Number of switch positions: 2. Industrial Surface Mount Sliding Switch - IP56. 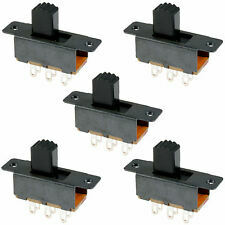 250V 15A - Twin Sliding Switches. o Contents: 1 SLIDING SWITCH. o Colour: Resistant white. o Device construction: Surface mounted device. o Type of connection: Screw connection. 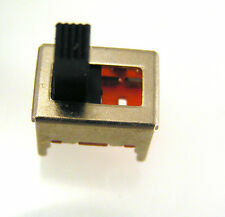 20pcs Small Slide Switch. SS23E04G5 Handle Length 5mm Slide Switch. (Manufacture Part Number: SK22H03. Knob height: 6mm. 2) Side knob Handle, height is 6 mm. Rated Load: DC 0.1A 120V. Insulation Resistance: greater than 0.1 ohm. Item included: 20 x Carburetor Guide Bar. Type : 1 Pole 2 Throw. Also a great component for DIY. Switch Total Size : 11 x 6 x 12mm/ 0.43" x 0.24" x 0.47"(L W H); Knob Size : 3 x 3 x 3mm/ 0.12" x 0.12" x 0.12"(L W H). Product Name: Slide Switch; Model: SS22F32Action Type: DPDT; Type: 2 Pole; Terminal Quantity: 6 Working Power: 0.5A 50V DCMounting Type: Through Hole; Withstand Voltage: AC 500V for 1 min Hole Diameter: 2.8mm/ 0.11"; Terminal Size(Each One): 4.7 x 1.8mm/ 0.18" x 0.07" ( L * W) Package Content: 10 x Slide SwitchColor: as shownWeight: 21gSwitch Total Size: 23.5 x 7.6 x 18mm/ 0.92" x 0.3" x 0.71" (L * W* H)Knob Size: 5.4 x 3.8 x 5.7mm/ 0.21" x 0.15" x 0.22" (L * W * H)Material(External): Plastic, Metal6 Terminals, Vertical Handle, 2 Poles, Sliding Knob Actuator.Widely used to control operation of many small power electronic projects, including volume and other controls for audio video, dimmer controls for lights etc. Note:Light shooting and different displays m.
Your support will keep us moving forward forever. AFRICA : All countries in Africa;. Pin Pitch : 2.54mm / 1". Type : 1 Pole 2 Throw. Insulation Resistance : 100mΩ Min at 500V DC. 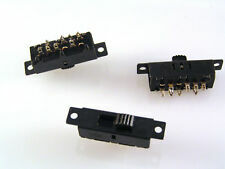 Switch Total Size : 8 x 4 x 10mm/ 0.31" x 0.16" x 0.39"(L W H). Working Power : 0.5A 50V DC. Your support will keep us moving forward forever. Quantity: 1Set(50Pcs). 50 X Toggle Switch. Pin: 6 pin. And due to the difference between different monitors, the picture may not reflect the actual color of the item. Main Color:Silver Tone, Black. 2 Pin Pitch 2.5mm. Positions 2 Poles 1 Throw. Height 8.7mm. (10pcs 1P2T 6 Pin Toggle Vertical DIP Slide Switch MSS-22D18 Fit for PCB Mount. Item included: 10 x slide switches. Action Force: 130-230 gf. 2) Color may vary slightly due to the color setting of each individual monitor. 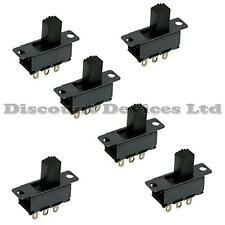 10Pcs SS24E01-G5 Slide Switches Vertical 0.5A 10 Pin 4 Position Toggle Switch. 10x Slide Switches. Action force:2.5±0.5N. Rated load:DC 50V,0.5A. Insulation resistance:500MΩMIN.AT500V DC. Due to the difference between different monitors, the picture may not reflect the actual color of the item. Specifications: 8 Pins toggle switch. Model: Toggle switch XC-2310 tip. Type: single pole double position. Number of sales: 5 pcs. DPDT = Double Pole Double Throw (Double throw is another way of specifying Change Over). Dolly Length 11.5mm Profile 5.2 x 3.8mm. Slot required 9 x 4mm.